Halloween is soon here, so you’ll definitely want to add one of these friendly witches from our archives to your spooky decor! Paint the medium-sized pot and the very small pot black. Paint the small pot light green. When the pots are dry, glue the small pot on top of the medium pot. Cut out a circle of black felt and glue it on top of the small pot. This is the brim of the witch’s hat. Glue the very small pot on top of the felt circle. All pots should be glued upside down. Cut a 4×2-inch rectangle of green felt. Cut thin strips most of the way through the felt (not cutting the strips apart). Glue this under the brim of the hat. This is the hair. Glue the eyes onto the witch’s face. Cut out a round green felt nose and glue it on. Draw on eyelashes, a mouth and eyebrows with the permanent markers. Cut out two black rectangles for sleeves. Glue these onto the medium-sized pot. Add two green felt hands. Glue the artificial daisy on top of the small pot that is the witch’s hat. To make the broom, have a grown up cut the sharp end of the skewer. Cut fifteen 2-inch pieces of string and arrange them in a bunch. Stick the skewer through the middle. Wrap a long piece of string around and around the smaller pieces to hold them in place. Secure the string with a coat of craft glue. 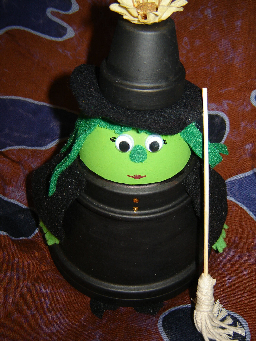 Set your witch out and get ready for Halloween! This witch may look a little spooky – but she’s really quite friendly! Hi Crafty Kimmy! What an awesome idea! Cool, and perfect for Halloween!